After a two-month hiatus, it’s finally time for another Mixology Monday! Locked in the dead cold of winter (well, it’s in the 60s here in Georgia), our venerable host, Doug, of the Pegu Tiki Blog has decided on a Tiki theme, bringing us a burst of faux-tropical sunshine to lift our spirits. 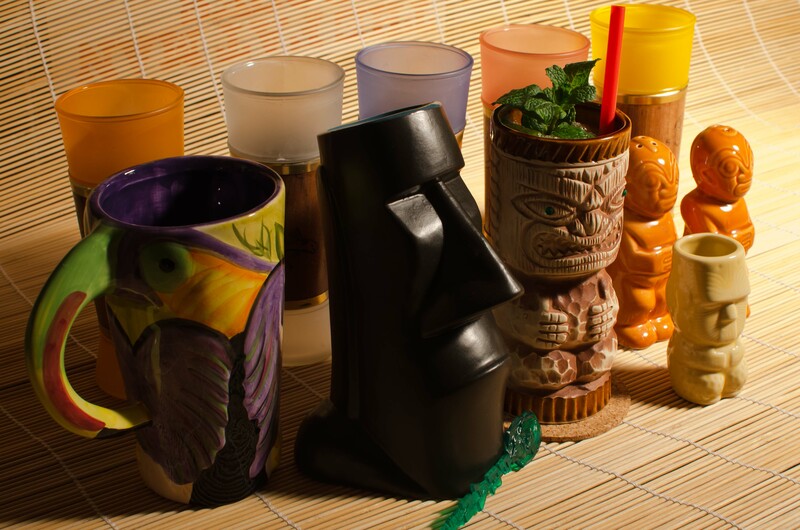 He’s invited us to blog about everything Tiki, not just the drinks, so it’s time to show off our Polynesian mixing prowess and campy collections. Chances are if you’re in any way connected with consuming cocktails you’ve sampled a Tiki drink of some sort. Tiki drinks, when done right, compete with the very best that neo-speakeasy bartenders with arm garters have to offer: they are complex assemblies of fresh fruit and multiple rums that, in many cases, can be imitated but never quite duplicated. 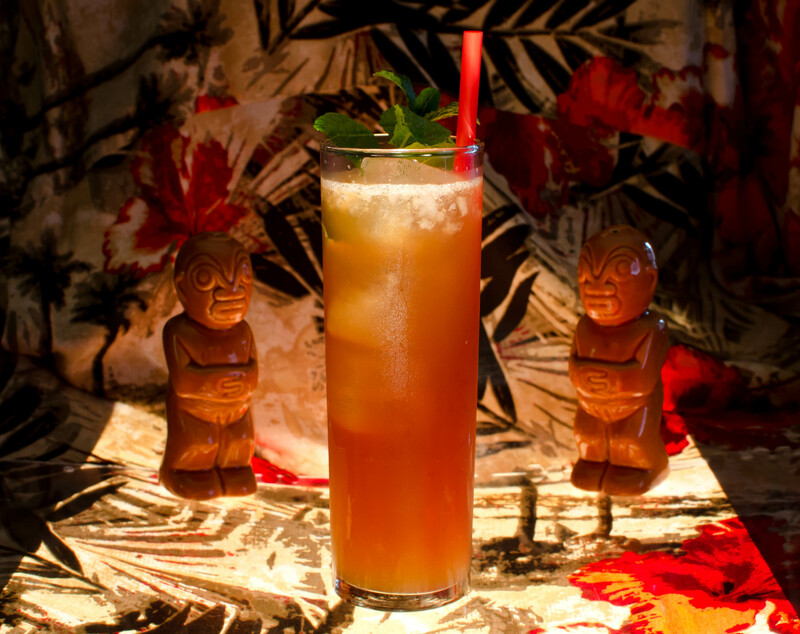 All those Mai Tais and Zombies you’ve had a touristy beach-side restaurants are probably nothing like the real things (the Mai Tai hails from 1941, the Zombie from 1934, and both have been diluted by decades of history and artificial mixers). There’s way too much history behind the Polynesian restaurant and drink craze that raged from the 1930s to the 1970s to present here (get yourself a copy of Jeff “Beachbum” Berry’s Sippin’ Safari instead), but it all really started with one man: Donn the Beachcomber. 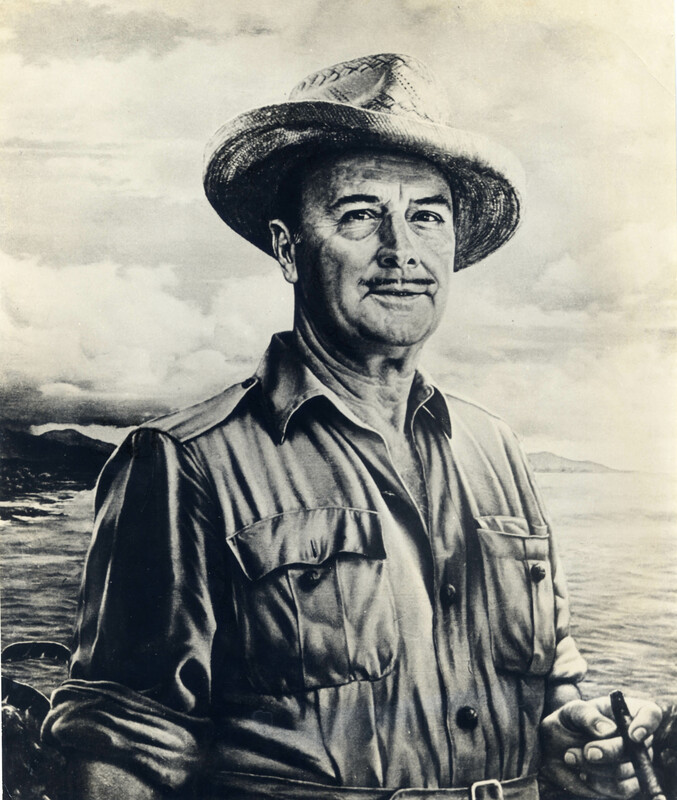 After forgoing a college education to travel the world, particularly the Pacific islands and the Caribbean, Donn ended up in Hollywood, California. There he used his Prohibition-era bootlegger connections to open up a café that was themed around all of his island-hopping adventures: the very first Don the Beachcomber. The faux-tropical, escapist atmosphere and the hefty rum drinks quickly gained popularity, especially among Hollywood celebs. In 1934, he originated the formidable Zombie, one of the most mysterious (he never published the original drink formula) and popular Tiki drinks of all time, probably due to its secret recipe and the “two-Zombies-per-visit” limit that Donn imposed on his customers. The popularity of both the Zombie and the Beachcomber restaurant gave rise to all sorts of imitations, arguably kick-starting the entire Tiki bar/restaurant phenomenon. 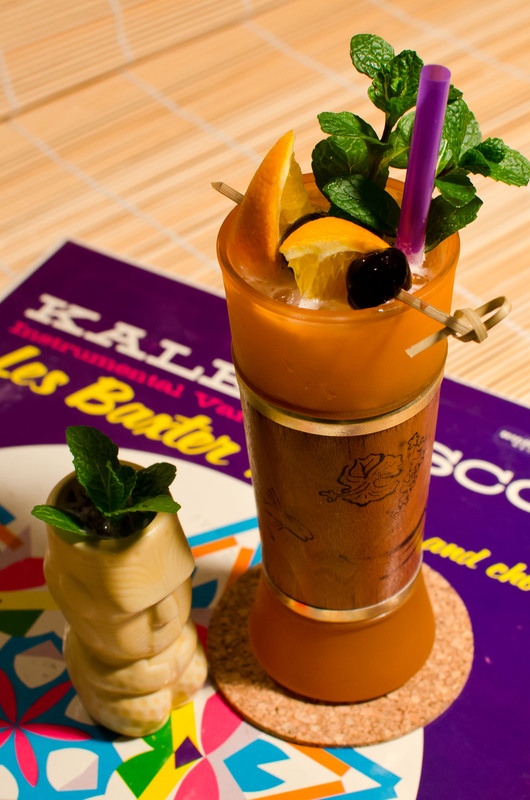 So, what better way to celebrate Tiki than mixing up the Big Kahuna of faux-tropical libations? There’s only one trick: I’ll be mixing up three different Zombies, each of which is attributed to Donn. Over the years he constantly tinkered with his recipes, tweaking them to suit changes in taste and the availability of ingredients. Oh, and besides the re-formulating, he was writing all of his recipes in code: hardly anyone was privy to his secrets, leaving competitors to guess what he might mean by “Don’s Spices #2,” provided that they even got their hands on his bartenders’ little black notebooks. All three of these “official” recipes have been uncovered by Beachbum Berry, and all three are demonstrably Donn’s. Do not attempt to mix and consume all three by yourself in one night, or you’ll be hurting the next morning. Load everything in a blender — ice last– and blend at full speed for 5 seconds. Pour, unstrained, into a chimney or Zombie glass, filling it with ice cubes if needed. Garnish with a sprig of mint. * Don’s Mix: 2 parts grapefruit juice (white, if possible) and 1 part cinnamon syrup. Do NOT use canned or bottled grapefruit juice…the stuff’s awful. The 1934 Zombie is my personal favorite, focusing more on the rum blend than the other ingredients, which provide more of an accent (they really act as a rum-delivery vehicle). The original contained Lowndes Jamaican rum (now defunct) and gold (read: dark) Puerto Rican rum of unspecified origin. Jeff Berry has revised his rum recommendations for the Zombie: go with Appleton V/X or Extra (I like the Extra) as a substitute for the Lowndes and Bacardi 8 or Añejo for the Puerto Rican. I don’t have any Bacardi, as I’m not a fan, so I went with Flor de Caña 7-year. Luckily, Lemon Hart has changed only slightly since the 1930s, the older one being oakier, so I’ve read, and is increasingly available down here in Georgia; it simply cannot be matched by anything else. The drink comes out as a wonderful, complex blend of rum flavors — the gupowdery depth of the Lemon Hart is matched with the buttery Appleton and smooth Flor de Caña while the syrups, citrus, and crushed ice just barely take the edge off of the alcohol. I hate to tinker with Donn’s recipe, but upping the lime and Don’s Mix by a 1/4 ounce and upping the grenadine to a full 1/4 ounce doesn’t seem to hurt the drink that much…the result is not so much superior as it is different. I’d like to try a true absinthe in lieu of the Pernod…to tell the truth, it seems slightly lost in the mix (The PDT Cocktail Book suggests using Vieux Pontarlier absinthe along with Bacardi 8 and Appleton Reserve rums). As far as glassware goes, I prefer a nice clear chimney or zombie glass over an elaborate Tiki mug. A single sprig of mint, not a bouquet of flowers and fruit, is the only garnish you’ll need. The Zombie should have a subtle air of minimalistic lethality about it…complex, deadly, and elegant. As you’re sipping, be sure to thank Jeff Berry for decoding the recipe via numerous interviews and bartender’s notebooks. A final warning: this Zombie is incredibly potent as it contains the equivalent of (nearly) 4 shots of 80-proof liquor, yet it remains remarkably smooth. Again, Donn was said to have limited his customers to two Zombies per night…a clever marketing gimmick, as well as a sensible guideline. Secondly, we have the 1950 Zombie, uncovered in the self-published Barbecue Chef by Louis Spievak, a chef in Los Angeles. A manual for home cooks, the book featured a number of Donn’s recipes, including a simplified Zombie re-tooled for home consumption but nonetheless an excellent addition to the family. Stir brown sugar into the juices to dissolve. Add remainder of ingredients, then shake with a generous amount of crushed ice and pour, unstrained, into a chimney or Zombie glass. Garnish with a mint sprig (and an orange slice and a cherry, if following Spievak). Very tasty and wonderfully tart, the Spievak Zombie more closely resembles all those “Zombies” being mixed behind the bars of Donn’s competitors, yet in Spievak’s book Donn claims the drink as his own. Whereas the 1934 original is a blast of rum and spice, the 1950 version is bright and refreshing, concealing its potency rather well. Here I went with Cruzan white and and Flor de Caña 7-year as flavorful stand-ins for the Puerto Rican rums. The rum, syrup and brown sugar add just enough sweetness to match the citrusy punch of the fruit, but I think the strength of the passion fruit syrup is a bit overwhelming…cutting back to about half-an-ounce should fix this. Otherwise, a nice take on the drink, though it tastes almost nothing like the 1934 Zombie. Jeff Berry, quoted in Vintage Spirits & Forgotten Cocktails, says, “although I’ve scoured hundreds of recipe books, I never saw a Zombie recipe I liked until I found this one.” Of course, that was before he decoded the 1934 and 1956 versions. Regarding the fruit: Donn rarely used lemon, but it combines nicely with the lime (try this with other lime-based cocktails, especially the Margarita, as it adds a new dimension of flavor). Pineapple juice? Get the stuff in the carton, not in the can (it picks up a bit of the metallic flavor), or if you’re ambitious, press your own. The trickiest item on the list is passion fruit syrup…Okole Maluna (by B.G. Reynolds, aka Trader Tiki) makes the best you can buy, but it’s pricey and should be used up quickly. Jeff Berry prefers using passion fruit purée combined with sugar, but Monin is available to me and doesn’t taste half-bad…a bit too much citric acid (Berry mentions that it’s too orangey), but it’ll have to do. The third and final “official” Zombie is from 1956. Published in Cabaret Quarterly, it is the drink that was being served at the Polynesian Village in Waikiki, having moved with Donn to Hawaii after losing control of his Beachcomber restaurants to his wife. Combine everything in a blender — ice last — and blend at high speed for 5 seconds. Pour, unstrained, into a chimney/zombie glass. Add ice cubes to fill if needed, then garnish with a mint sprig. Much more complex than the Spievak Zombie, one can see how this version may have evolved from the original 1934 “Punch.” I find the 1956 version much more balanced than its homespun 1950 counterpart: not too sweet, not too tart, but way too much maraschino liqueur. I mean, a 3/4 ounce? It’s great stuff, but good grief! For the version pictured above, I used a 1/2 ounce, and the liqueur still dominated (I used Luxardo…how Maraska would compare, I’m not sure). Still, behind all of the rustic cherry flavor I pick up on everything else that’s going on. The rum blend from the original punch (I used Flor de Caña 7-year and Appleton Extra once again) makes a reappearance, as do the grenadine, absinthe, falernum, and bitters. I’d likely pick this as a favorite version if that maraschino were under control: the rum is very present yet pleasantly balanced out by the nearly equal amount of juice and syrup — the original is pretty much a very enjoyable blast of rum. For all of these Zombie recipes, remember to slap the mint in your hands or against the side of the glass to release its aromatic oils. Oh, and if you’d like to see the 1956 Zombie mixed up, Robert Hess has got it covered. As for grapefruit juice, the question of white grapefruit vs. pink or red grapefruit has vexed me for some time…the local megamarts never seem to have white grapefruit, though I haven’t checked the farmer’s markets. The Bum insists on using white, as he deems the red and pink to be too sweet, but I’m forced to work with what I have (I’ve tried the bottled white juice before…I believe it was from concentrate, and it was absolutely terrible). In case you find a white grapefruit and would like to avoid its bitterness, check out Colonel Tiki’s Guaranteed-to-Satisfy Grapefruit Whacking Method. If, after all that mixing, you yearn for more Zombie recipes, well, start punching words into your Google search bar, but I suggest taking a look at the Webtender Wiki’s Zombie page and Kaiser Penguin’s Zombie Recipe Comparison (yes, the post is from 2006, before the 1956 and 1934 recipes were unearthed, I believe). On a slightly different tack, I’m an enormous fan of cheesy 60s lounge music. True, it’s not always on my playlist, but it’s one of those things that’s so bad it’s good. The best kind that doesn’t involve the Hammond B3 organ is, of course, Exotica. While you’re sipping those Zombies, be sure to give a Martin Denny or Les Baxter record a spin. Looking for more cheesy goodness? I thought so. Check out the Ultra-Lounge series to get your fill, but I have a couple other suggestions as well, namely “Something for Cat” and “It Had Better Be Tonight,” both by Henry Mancini. WRAS Atlanta, out of Georgia State University, used to broadcast a program called “Martinis Con Queso” that featured just about everything in this vein, but it no longer seems to exist except for a few playlists lingering on in the blogosphere. I also love Hawaiian shirts: you may have noticed them as background fabrics in my various Tiki-related photos; they’ve also been making regular appearances at our monthly Cocktail Nights. Finally, while all of this rambling on about Zombies, cheesy music, and colorful shirts is perfectly acceptable, my very favorite Tiki drink is, in fact, the Trader Vic Mai Tai, but I’m not quite ready to journey down that particular rabbit hole. And yes, I like mine with Rhum Clément VSOP and Appleton Extra. 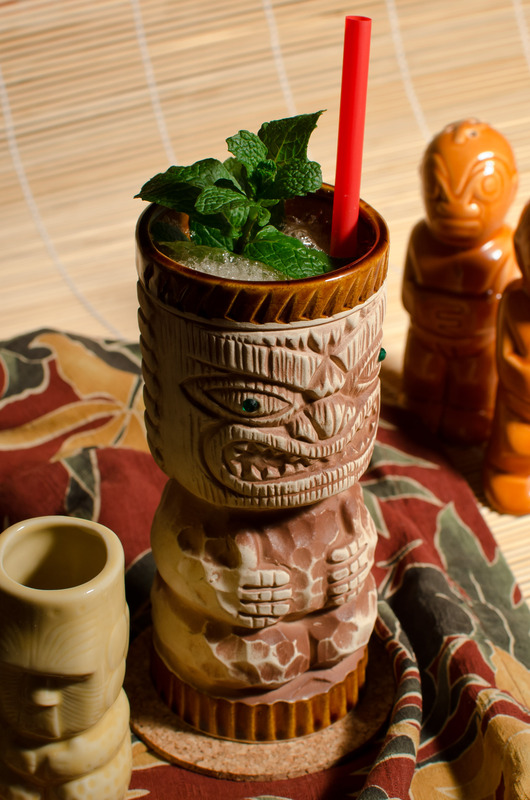 Serious Eats, however, has a few recommended Tiki drinks that I suggest you try. This entry was posted on February 19, 2012 by IJ Lauer in Angostura, Cinnamon Syrup, Drink Recipe, Falernum, Grapefruit, Grenadine, Lemon Juice, Lime Juice, Maraschino, Mixology Monday, Passion Fruit, Pastis, Pineapple, Recipe Comparison, Rum, Tiki and tagged 1934 zombie punch, 1950 zombie, 1956 zombie, don the beachcomber, mixology monday, tiki.